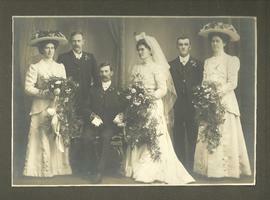 Item is a photograph of a wedding party believed to be of George Anderson, son of Charles Marshall AndersonCardboard frame suggests wedding took place in New Zealand ("Bunting, Palmerston North and Napier"
Item is a Christmas card sent from Pearl Wry to John and Mabel Alward. Enclosed is a sprig of cedar and a poem. 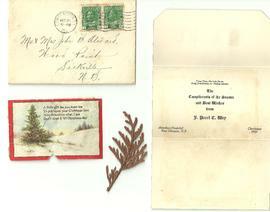 Card was sent from Aberdeen Hospital, New Glasgow, Nova Scotia. Original envelope included. Items are health and accident insurance information sheets, cards, payment records, etc. from the Continental Casualty Company.